Came back quite late from office  was about midnight when I entered the house. I am supposed to be in Velachery tomorrow morning by 9:30 AM. Must sleep now. Anyway, let’s see how things turn out. Darna Zaroori Hai was released today and I’m looking forward to seeing it. I really enjoyed the first movie Darna Mana Hai, and this seems even better! EDIT: 1:55 AM: Just watched an online preview of Darna Zaroori Hai. It’s a three-minute video in RealPlayer format, direct download link here. Every month-end, there are these reports I have to make and send on the last day. This is a really tedious task (argh) and I am working on one such report now. The last day of the month is always pretty painful in this respect, however, there is a wonderful feeling that takes over once the reports are sent across. May 1 being a holiday means that there is a "long weekend" coming up (Saturday, Sunday and Monday). So what plans for this? Many movies to watch  A History of Violence, Léon (International Version), The Fifth Element, Starship Troopers, Underworld. Saturday is TMNT Day for me  Back in 1992 or 93, I became a huge fan of the Teenage Mutant Ninja Turtles. I watched episodes of the cartoon on tape, bought TMNT II on videotape and watched it so many times that the tape literally got worn out, read whatever TMNT comics I could get my hands on, and drew the Turtles a lot. A couple of years later the cartoon was shown on STAR TV, and I watched pretty much every episode that they broadcasted. Now on Saturday, I plan to watch Teenage Mutant Ninja Turtles in the morning, Teenage Mutant Ninja Turtles II: The Secret of the Ooze in the afternoon, and Teenage Mutant Ninja Turtles III in the evening. This is going to bring back some fond memories!! Access to MySQL database on my site  Sometime in 2004, my host removed access to phpMyAdmin, because of which I couldn’t update the database on my site Karthik82.com. Well, now I do have access to it, so I plan to update some sections that are badly in need of updating! I have more than a year’s worth of entries to add to the Movies List, and I also plan to add some of the reviews and drawings which I posted on my older blog, to the site itself under the relevant section. EDIT: 9:45 PM: Slight change of plans. Apparently I have to go to the TCS Velachery office tomorrow. So TMNT Day will have to be shifted by a few hours. Just had a cup of Bru Cappuccino Mocha now, and must say this is really good! This is sold in sachets that cost Rs. 6 each (single-serving). You simply empty a sachet into a cup, add 120 ml. of hot water and sugar and you’re ready to go. Very tasty indeed! The first Scary Movie was designed as a spoof of two of the most popular horror movies of the late 90s  Scream and I Know What You Did Last Summer. The sequel went for a more original story, while working in some spoofs of popular movies of its time. While both these were strictly R-rated comedies, the third film, Scary Movie 3 was PG-13 rated, and pretty much different in tone from the first two. Director David Zucker made it more a Hot Shots-style spoof film. The plot lost all importance  the movie was simply a loosely connected set of scenes parodying other popular movies. Still, I actually thought the third movie was the best of the series (a big factor being Charlie Sheen’s performance), and therefore was pretty excited when I heard that Scary Movie 4 was going into production, with the same crew as Part 3. The teaser poster (which implied spoofs of Saw, The Grudge, The Village, War of the Worlds and King Kong) was great, the trailer further increased expectations, and the later poster art (which had three Saw-style severed fingers forming the numeral four) led me to believe that this sequel was going to be better than its predecessor. An attempt to describe the story of Scary Movie 4 (which is virtually non-existent  even more so than Part 3!) would be as follows: Cindy Campbell (Anna Faris) takes up a job as a nurse for an elderly woman, and is attracted to next-door neighbour Tom Ryan (Craig Bierko). Soon alien tr-iPods start attacking humanity, and Cindy realises that entering a secluded village might hold the key to saving Earth (it’s pretty much an excuse, really!). Unfortunately, I was disappointed after seeing the movie. I wouldn’t say the movie is a total waste of time, because there were certainly some funny and creative bits, but this time, there seemed to be a larger percentage of jokes that failed to have impact. Maybe I wasn’t in the mood to appreciate the jokes, or maybe I was expecting too much  but on the whole, this seemed a lot duller than Part 3. The positives here though, were the well-done recreations of the scenes from the movies being spoofed, and Anna Faris’s and Craig Bierko’s performances. Some of the visual effects also seemed pretty good, especially considering they must have been done on a much lower budget than the blockbuster they were modelled after! Still, I’d rate this a 6/10 overall. Finally, a question  what happened to the spoof of King Kong that was promised by the teaser poster? Rajith and myself got an internet connection at home today (finally  it’s been about 10 months since we came to Chennai). It’s a 256kbps Broadband Connection from Tata Indicom. We also bought a switch so that both our computers can use the connection. Tried voice chat over Google Talk with Varun today. Hopefully, this connection will mean more regular updates and more movie reviews and other interesting stuff on this blog. Been having trouble publishing to my blog recently… so I’ve created an account at WordPress.com. The new blog is at https://karthik82.wordpress.com. V for Vendetta was one of the movies I’d been waiting to see for quite some time. Before watching the movie though, I wanted to read the book. It all worked out very well, as I bought and read the book some days back, and today, I got to see the movie itself. The added bonus was that I watched it on an IMAX screen! Britain in the near future is a dystopic society, ruled by a totalitarian government under the control of Supreme Chancellor Adam Sutler (John Hurt). Evey Hammond (Natalie Portman) works for the British Television Network, and one night when she is out after curfew, a group of "fingermen" (the government-appointed police) attempt to attack her. She is saved by a mysterious masked figure who calls himself V (Hugo Weaving). Beginning with the destruction of the Old Bailey, V perpetrates terrorist acts  blowing up buildings, assassinating several key members of the government. The intention of these acts initially, seems to be to cause chaos, but as more of V’s background is revealed, we understand the larger scheme of things and the motivations behind his vendetta. Evey’s involvement with V’s scheme is a reluctant one at first, but becomes more significant later on. V and Evey are pursued by government-appointed investigators Finch (Stephen Rea) and Dascombe (Ben Miles), who must stop him before the culmination of his grand plot  being planned for the Fifth of November, one year hence. As I’d read the book just a few days earlier, the natural tendency was to compare that and the movie version, whose screenplay comes from the creators of The Matrix trilogy, The Wachowski Brothers. There are several differences in terms of the characters (for example, Evey in the book is a lot younger, Detective Finch is not as sympathetic as he is in the movie, etc. ), some subplots have been dropped, and V’s motivations for overthrowing the government (and his personal vendetta) have been made more clearer. However, overall, the movie is very faithful to the book, and some portions (especially Evey’s imprisonment) make the transition completely intact. I thought the movie was much tighter than the book, and certainly, at some times it seems even relentlessly fast paced. Despite the fact that this is not really an action film, it contains a couple of exciting and imaginative action sequences in the Matrix vein (director James McTeigue assisted the Wachowskis on all the Matrix films). The acting is very good  Natalie Portman is very effective as Evey, and considering that you never get to see Hugo Weaving’s face (he wears the Guy Fawkes mask throughout and has only his voice to act with), his portrayal of V is superb. The movie also looks gorgeous and deserves to be seen on the big screen (me seeing it on IMAX definitely did not hurt!). This was the last film to be shot by its cinematographer Adrian Biddle, who passed away some time after its completion (the film is dedicated to his memory). Finally, I also thought the movie was well served by a very nice music score by Dario Marianelli. The movie is well-realised in all aspects, I’d rate it a 9/10. EDIT: 1 May, 3:19 PM: I forgot to mention that I was in Hyderabad when I saw this, hence the IMAX screen. Been having some trouble publishing to my site through Blogger, so trying out WordPress. I like the fact that you can categorise posts here, so maybe I’ll keep using this. See the books I’m holding up in the picture? I read V for Vendetta some days back  and now I’m going to watch the movie. 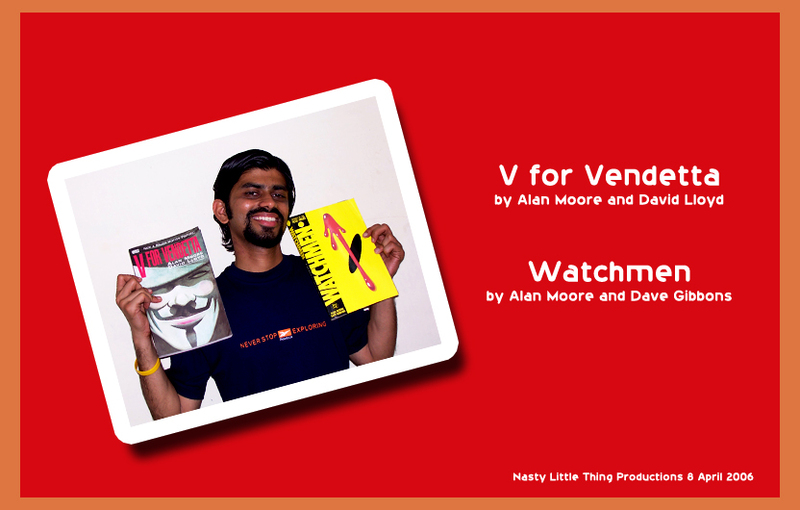 No, I haven’t seen the movie yet, this post is about the book V for Vendetta by Alan Moore and David Lloyd, which I finished reading today. I wanted to read the book before seeing the movie, so last Wednesday, I went to Landmark at Spencer’s Plaza with the intention of buying it (I had seen copies there a couple of months back). However, on that day, all copies of the book they had had been sold out, so they said they would get a copy for me in a few days’ time. I told them that it was a bit difficult for me to come to Landmark as I live far away  so they offered to deliver the book home! I got my copy this morning, at around 8:30 AM. Must say it was really nice of them to deliver the book home! The book is pretty expensive here  it costs Rs. 845 (one more in my collection of expensive comics  after Watchmen, Crisis on Infinite Earths and The Art of Hellboy). I finished reading the book in the morning, and it was a wonderful piece of work! I will write another post on this, but anyway, I know that re-reading the book will definitely be even more rewarding. Needless to say, I’m very happy to have got the book! Looking forward to watching the movie now (I hear it’s very good, though some articles say that the anarchist themes in the book have been diluted/simplified/misrepresented in the movie). I’ve been playing Doom³ recently. It is an awesome game. Of course, the older games still appeal to me more as they run better on my computer, and they present an altogether different experience to the player. Anyway, Doom³ is far more horror-oriented than action  the cinematic quality of the graphics and the superb sound effects all combine to produce an unforgettable experience. Simply put, it’s like being immersed in a horror movie, and the game has made me jump in fright on several occasions. I’m reminded of what Trent Reznor said on the Doom III: The Legacy video a few years back  the game focuses on getting into your head and making it a scary place to be. I’m still at an early stage in the game, so I don’t know how things will be as it progresses. Hopefully the "monster suddenly appearing out of the dark"-type jump scares won’t get too repetitive! I also love the theme music for the game, by Tweaker. SIDE NOTE: Speaking of Tweaker and Trent Reznor, over the last few months I’ve become quite a fan of Nine Inch Nails. Favourite songs: "Closer", "The Hand that Feeds", "Heresy", "Only", "Head Like a Hole".